Telecommunications is becoming ever more important for vehicles. At TU Wien, a new antenna concept has now been developed for cars. Driving without communication technology has now become almost unthinkable. It seems quite normal to us that navigation systems regularly update their maps and shows us the way using satellite data, or that we can make phone calls while driving. In the future, data exchange will play an even greater role in road transport, not least to improve road safety. This does mean, however, that new options need to be found for housing antennas in cars. At TU Wien, a special antenna box has been developed that can be integrated into the front area of the car roof. Detailed measurements show that the directionality of wireless signals is very good around cars, and with the new antenna variants cars are extremely well equipped for the wireless requirements of tomorrow. “Antennas in cars are usually installed in what is known as the shark fin,” says Gerald Artner (Telecommunications, TU Wien). “This is a compact attachment that is mounted on the rear of the car’s roof.” However, it is not possible to house any number of antennas in this kind of shark fin attachment; first of all, there is not enough space, and second of all the antennas can interfere with one another when they are packed too tightly. This is problematic because the telecommunications capabilities of cars are expected to be significantly expanded in the coming years: “In the future, cars will cooperate on the roads,” says Gerald Artner. “A car would warn others of hazards, for example of a slippery patch after the next bend in the road.” Communication between cars and fixed infrastructure is also expected, and even the ways in which communication between smartphones and vehicles could be utilised to improve road safety is being considered. With a mobile phone signal, the car could detect a pedestrian before they are even within view. At TU Wien, the decision was therefore made to develop a new method for installing antennas in cars which overcame the upcoming technical challenges. Gerald Artner constructed an antenna box from carbon-fibre-reinforced polymer material which could be installed in the front part of the roof, close to the windscreen. “The key question was whether antennas could actually be installed in the car’s roof and whether realistic measurement results across the entire vehicle were still comparable with the laboratory measured values,” says Gerald Artner. In cooperation with the Thüringer Innovationszentrum Mobilität [Thuringian Centre of Innovation in Mobility] at TU Ilmenau in Thuringia, this kind of antenna cavity was built into a car roof for the first time. The entire car was then surveyed in the only research laboratory of its kind in Europe, the Virtual Road Simulation and Test Area (VISTA), in order to identify the resulting radiation patterns. 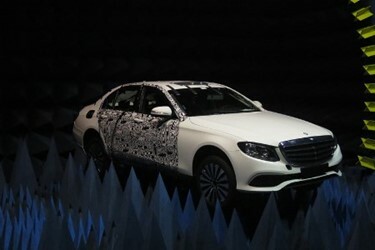 It would also be possible to combine several antenna concepts in future cars. This would help compensate for any interference even more effectively. The results from TU Wien have now been published in the specialist journal ‘IEEE Antennas and Wireless Propagation Letters’.